Background: Although genetic variations are heritable, some quantitative traits like longevity may have non-genomic influence on heritability. Laboratory-selected inbred strains of extended longevity phenotype of Drosophila offer an opportunity to study the inheritance of longevity. Objective: The aim of the study was to examine the heritability of longevity in an extended longevity phenotype of Drosophila melanogaster using reciprocal cross effects in F1 and F2 generations. Methods: Lifespan variations of virgin and mated flies in parent, F1 and F2 generations were investigated using reciprocal crosses between normal and long lifespan lines of inbred population of D. melanogaster. Heterosis, narrow-sense heritability, recombination loss, maternal effect and overdominance with respect to survivorship in virgin and mated flies were analyzed. Results: Virgin flies lived longer than mated flies. 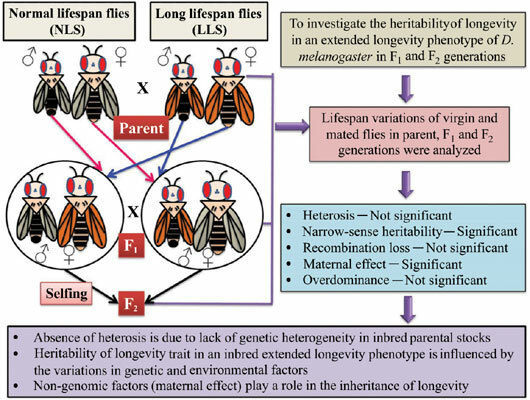 There was no significant effect of mid-parent heterosis, recombination loss and overdominance on variations in longevity, whereas, significant maternal effect and narrow-sense heritability were observed in mated and virgin flies, respectively. Conclusion: Absence of heterosis in our study population of Drosophila phenotypes could be due to the lack of genetic heterogeneity. The heritability of the longevity trait in an inbred extended longevity phenotype depends on the variations in genetic and environmental factors. Keywords: Inbreeding depression, heterosis, maternal effect, epigenetics, long lifespan, virgin, reciprocal cross. Keywords:Inbreeding depression, heterosis, maternal effect, epigenetics, long lifespan, virgin, reciprocal cross. Abstract:Background: Although genetic variations are heritable, some quantitative traits like longevity may have non-genomic influence on heritability. Laboratory-selected inbred strains of extended longevity phenotype of Drosophila offer an opportunity to study the inheritance of longevity.